Will harbor porpoises (Phocoena phocoena) habituate to pingers? 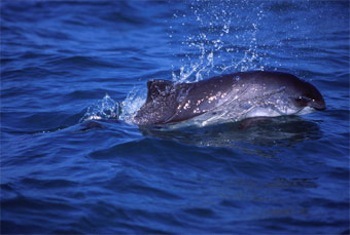 There was a significant difference in the number of porpoise clicks between nets with and without pingers, but the extent of displacement could not be determined. No evidence of habituation to the pingers. Can acoustic deterrent devices reduce by-catch in the Cornish inshore gillnet fishery? Although it is believed that the harbor porpoise population is not seriously in danger at present, incidental catch of the species in gillnets continues to be the primary threat throughout its range (Hammond et al 2008). Off the eastern coast of the US, an estimated 1200 to 2900 harbor porpoises were killed annually in gillnets between 1990 and 1996 (Waring et al 1998). In the North Sea, Danish annual estimates of bycatch ranged from 2867 to 7566 between 1990 and 2002 (Vinther & Larsen 2002). There are no related field studies for this citation.